Formaldehyde in flooring has been a concern of many homeowners of recent. Formaldehyde in flooring concerns started with a 60-minute episode featuring a national flooring retailer accused of selling Chinese made laminate with high levels of formaldehyde. Since the first airing and the following related reports, many homeowners have had concerns with formaldehyde in flooring, especially laminate flooring. Homeowners have been having their houses checked for potentially toxic levels of formaldehyde in flooring. Others have been having their laminate flooring lab tested. Some have gone as far as tearing out their laminate flooring not knowing if their floor was emitting unhealthy levels of formaldehyde. In reality, excessive amounts of formaldehyde in flooring are few as compared to the total amount of laminate flooring installed. Formaldehyde is present in composite wood products including but not limited to laminate flooring. Many wood products are made using urea formaldehyde adhesives. Formaldehyde can be found in building materials, products such as plywood, particleboard, cabinets, furniture, hardwood and medium density fiberboard. Formaldehyde is found in home furnishings including textiles, wallpaper, wood floor finishes and paint. Other uses include household cleaners, personal care products, medicine and even yard products and pesticides. Formaldehyde is a naturally occurring substance in the air we breath and is also released by burning wood, automobiles, gas, oil and even cigarettes. 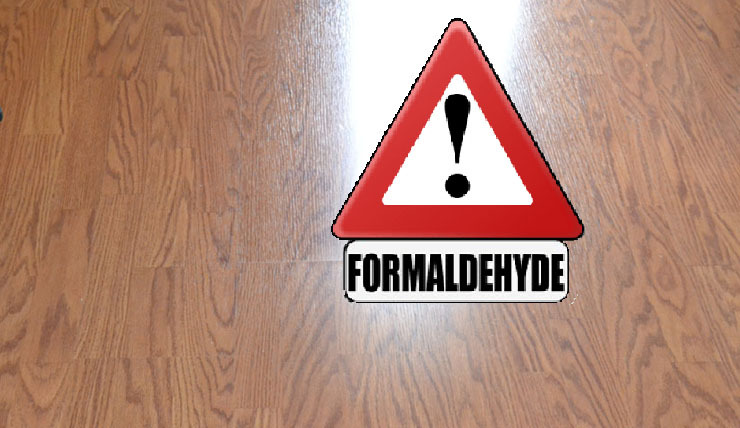 Should You Test for Formaldehyde in Flooring and/or your Residence? The amount of formaldehyde we are normally exposed to is considered safe. It is not until we get into higher levels of formaldehyde that it becomes a concern. The Consumer Product Safety Commission in their March 2015, update on formaldehyde states regarding formaldehyde emissions testing, “It should not be necessary to measure formaldehyde in your indoor air if you reduce existing formaldehyde levels and do not introduce products that emit formaldehyde into your home. However, if you become ill following installation of a product that has been manufactured with formaldehyde, you should consult a physician to determine whether or not your symptoms might relate to indoor air quality problems. If your physician believes that you may be sensitive to formaldehyde, you may want to have the levels of formaldehyde measured. Another source for answers on laminate flooring is the EPA.